LONDON; A rebound in European stocks has been fuelled by low expectations and valuations and belies the underlying health of corporate Europe. After a terrible December, markets have had a buoyant start to the year. 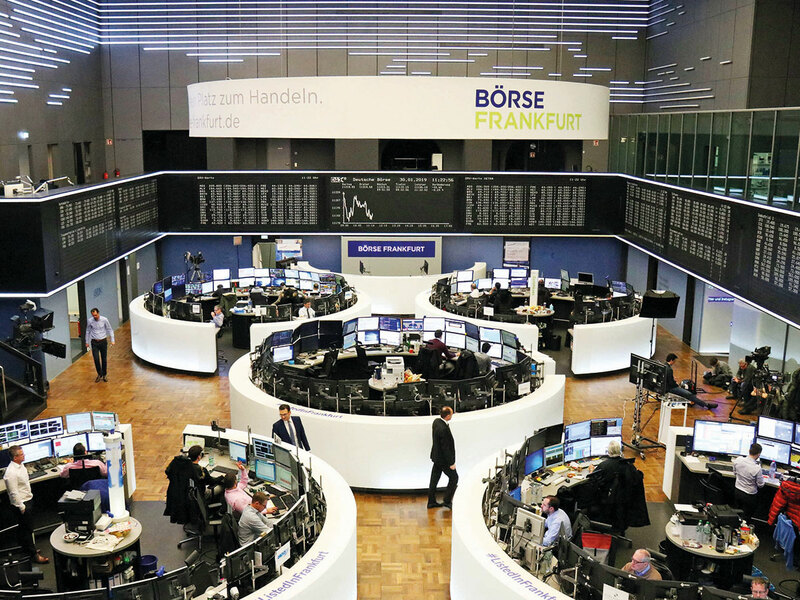 European stocks on Wednesday were up 11 per cent from late December having lost 13 per cent in 2018 — their worst year in a decade. Morgan Stanley calculated that shares of companies that beat estimates outperformed by 3 per cent on average while those that missed underperformed by 1.8 per cent — a clear positive skew. So far 56 per cent of companies have beaten revenue estimates, while just 47 per cent have beaten earnings estimates. Already braced for the worst, investors have been forgiving towards companies failing to deliver fourth-quarter results on target. Chipmaker Infineon, for example, only fell 0.6 per cent despite cutting its forecast for full-year revenue growth to the lower end of its 9-13 per cent range. “Markets are well aware that the first and second quarters will be difficult. But they also expect that the second half should be the better half of the year, showing some recovery,” said Britta Weidenbach, head of European equities at DWS. “If markets are right, then we could be near the bottom.” Valuations fell as markets tanked in December, limiting the downside for stocks. European equities’ price-to-earnings ratios were as low as 12.1 in January, the lowest since July 2013. They are now around 12.9, still historically very low and much lower than US stocks trading on a multiple of 15.8. “(Investors) are pricing in quite a bit of bad news. So I think the market is quite reasonably balanced now,” said Graham Secker, head of European equity strategy at Morgan Stanley. Scratch the surface though and the latest earnings results show wide divergences within sectors — an indication investors are being picky rather than being encouraged by any macroeconomic factors. The overall share of companies beating earnings expectations is the lowest since the fourth quarter of 2015, and the last time European companies mentioned a slowdown as much in their results was during the financial crisis of 2008-2009, according to Alphasense, a data analysis company. The positive share price reactions were most obvious in luxury and industrials, two sectors where angst about a slowdown in China had significantly dented expectations and valuations. French luxury conglomerate LVMH, for example, surged 6.9 per cent after reporting sales growth of 9 per cent, in line with forecasts. Highly-valued shares in sectors like technology and consumer staples were punished for weak numbers. Chipmaker AMS lost 12 per cent after fourth-quarter profits sank, only to swing back 10 per cent the following day, thanks to the forgiving mood of the market. Consumer goods giant Unilever tumbled 2 per cent after reporting a disappointing sales performance, but quickly regained ground as stocks generally rallied. Bank stocks were notable for being held back, Morgan Stanley’s Secker said, as investors remain wary of the sector which tanked 30 per cent in 2018. “We’re concerned in this cycle that banks are the value trap — it might be you’re waiting for a leg up in bank stocks that never occurs,” said James Bateman, chief investment officer of multi-asset at Fidelity. Could the best be over? The recent rally has not stopped outflows from European equities: $9 billion has left the region so far this year after investors pulled more than $72 billion from European equity funds in 2018, more than any other region, EPFR fund flow data shows. And there remains a big gap between bottom-up consensus earnings growth expectations — of 7.4 per cent in 2019 — and top-down estimates by strategists based on macroeconomic models of roughly 1 per cent, pointing to potential further earnings growth downgrades ahead. “Your fundamental reasons to buy because of earnings or an increase in liquidity — those two elements are missing,” said Manish Kabra, head of European equity and quant strategy at Bank of America Merrill Lynch. Company margins also make for uncomfortable reading. For the third quarter in a row, margins are under pressure from higher labour and commodity costs. So far 56 per cent of companies have beaten revenue estimates, while just 47 per cent have beaten earnings estimates, Refinitiv data shows. “Most companies are mentioning prices they struggle to pass on to customers,” said Fabrice Theveneau, head of global equities at Lyxor Asset Management. With confusion over Brexit and European parliamentary elections in three months’ time, the market continues to be dogged by political uncertainty and stocks may have a harder time climbing if earnings downgrades continue. Indeed, those investors that sat this rally out may have missed all the gains they were likely to make this year in European equities, according to Goldman Sachs.